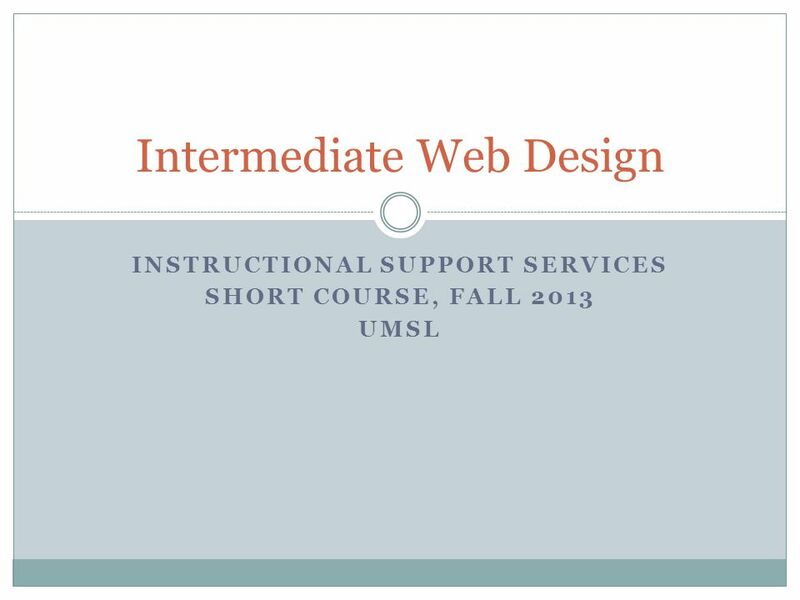 INSTRUCTIONAL SUPPORT SERVICES SHORT COURSE, FALL 2013 UMSL Intermediate Web Design. 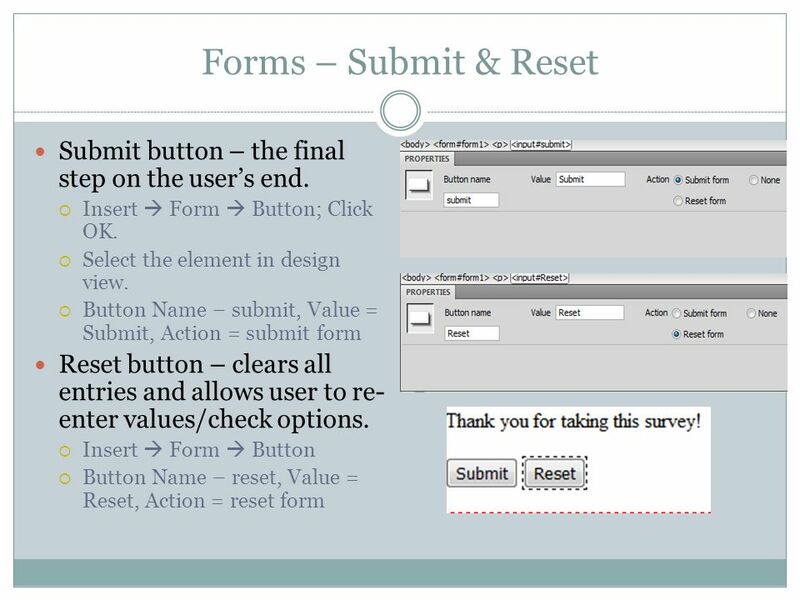 3 Forms and How They’re Useful You can create forms for several purposes:  Surveys – design questionnaires for data collection purposes.  A “Contact Us” Page – a page where the end user can request more information or give customer feedback.  E-Commerce – forms with validation and security designed to collect information about the purchaser and confirm the purchase of a product or service. 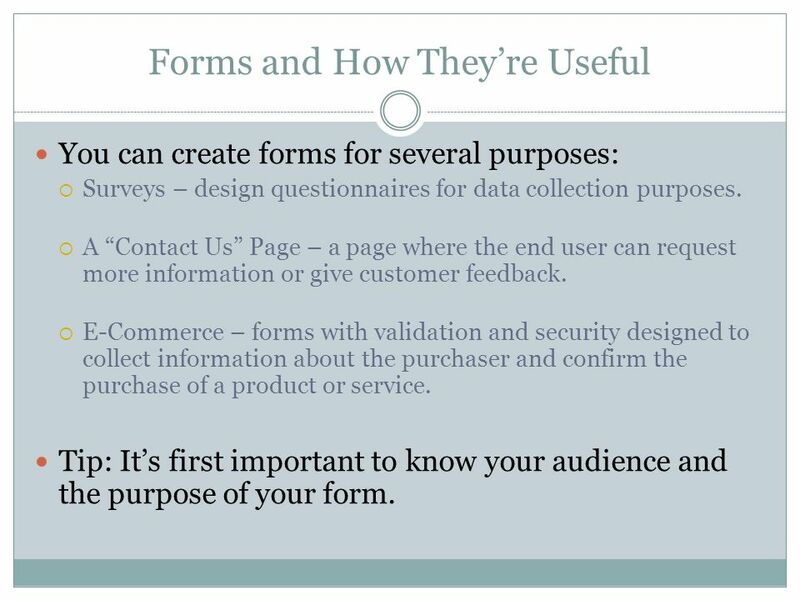 Tip: It’s first important to know your audience and the purpose of your form. 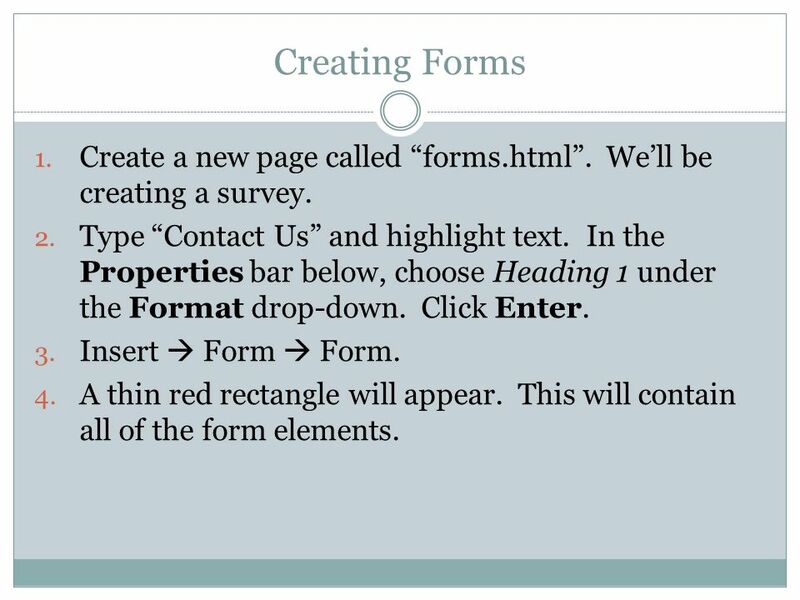 5 Creating Forms 1. 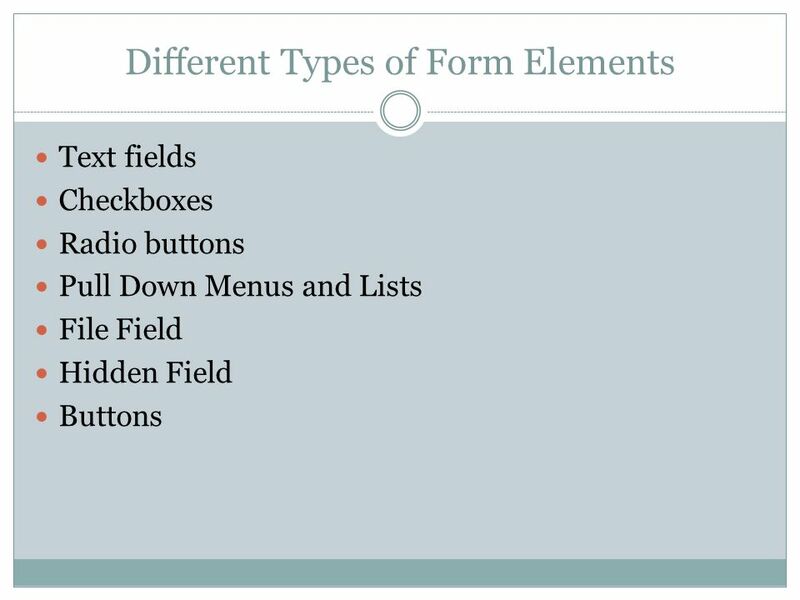 Create a new page called “forms.html”. We’ll be creating a survey. 2. Type “Contact Us” and highlight text. In the Properties bar below, choose Heading 1 under the Format drop-down. Click Enter. 3. Insert  Form  Form. 4. A thin red rectangle will appear. This will contain all of the form elements. 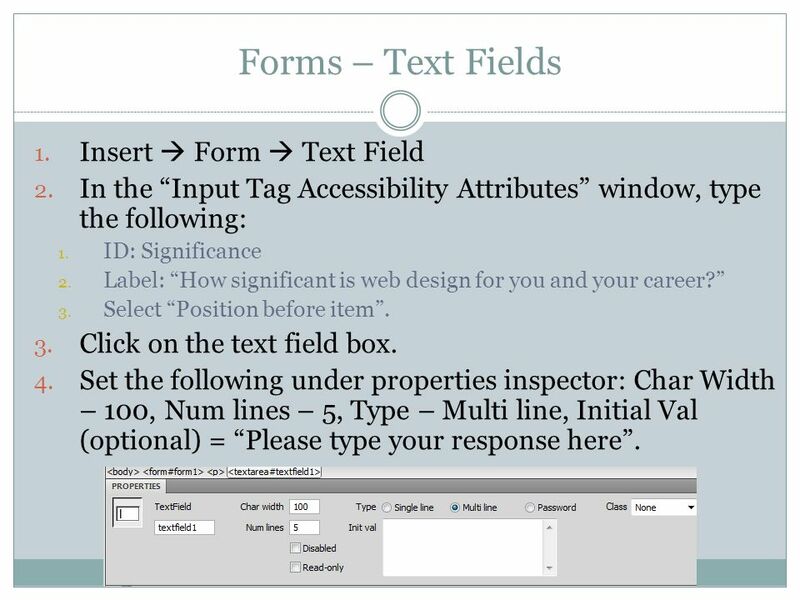 7 Forms – Text Fields 1. Insert  Form  Text Field 2. In the “Input Tag Accessibility Attributes” window, type the following: 1. ID: Significance 2. Label: “How significant is web design for you and your career?” 3. Select “Position before item”. 3. Click on the text field box. 4. Set the following under properties inspector: Char Width – 100, Num lines – 5, Type – Multi line, Initial Val (optional) = “Please type your response here”. 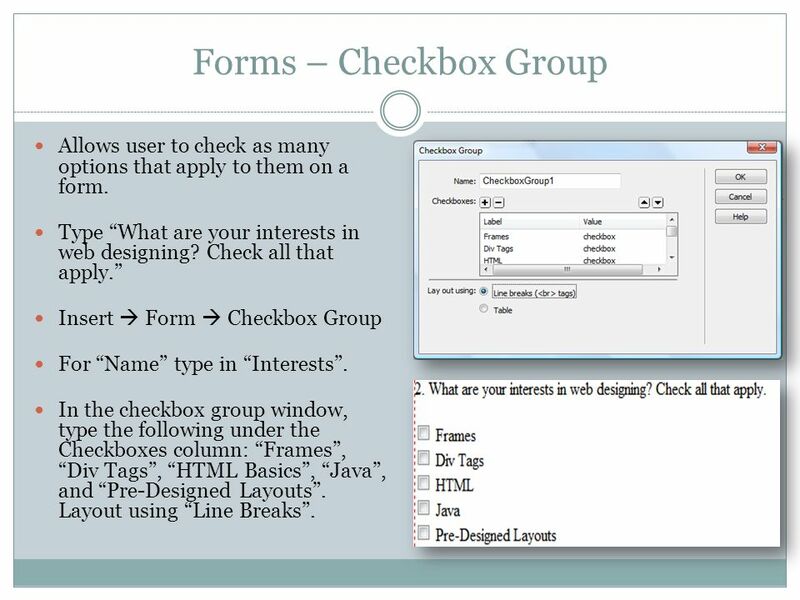 8 Forms – Checkbox Group Allows user to check as many options that apply to them on a form. Type “What are your interests in web designing? Check all that apply.” Insert  Form  Checkbox Group For “Name” type in “Interests”. In the checkbox group window, type the following under the Checkboxes column: “Frames”, “Div Tags”, “HTML Basics”, “Java”, and “Pre-Designed Layouts”. Layout using “Line Breaks”. 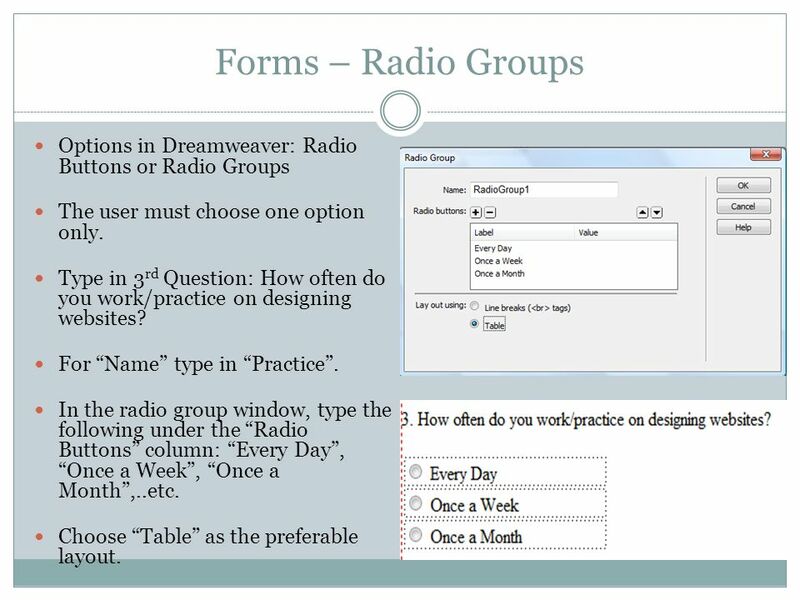 9 Forms – Radio Groups Options in Dreamweaver: Radio Buttons or Radio Groups The user must choose one option only. Type in 3 rd Question: How often do you work/practice on designing websites? For “Name” type in “Practice”. In the radio group window, type the following under the “Radio Buttons” column: “Every Day”, “Once a Week”, “Once a Month”,..etc. Choose “Table” as the preferable layout. 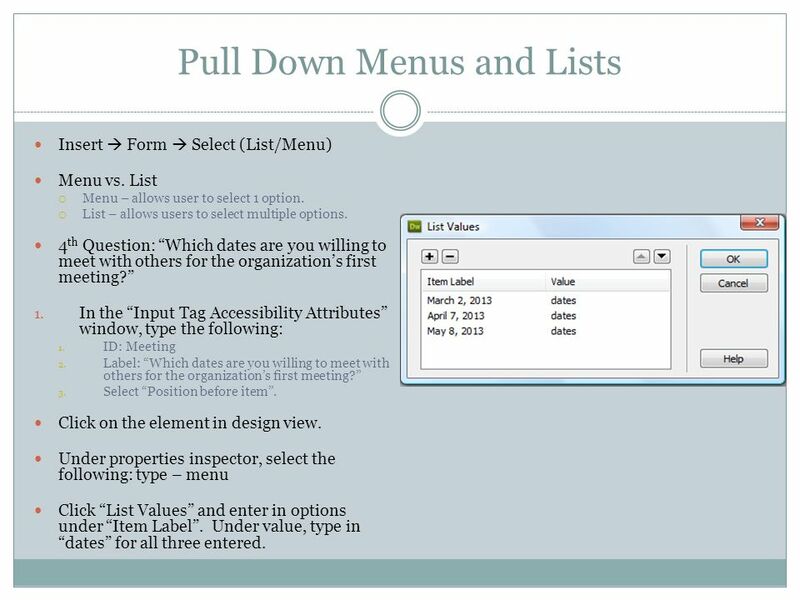 10 Pull Down Menus and Lists Insert  Form  Select (List/Menu) Menu vs. List  Menu – allows user to select 1 option.  List – allows users to select multiple options. 4 th Question: “Which dates are you willing to meet with others for the organization’s first meeting?” 1. In the “Input Tag Accessibility Attributes” window, type the following: 1. ID: Meeting 2. Label: “Which dates are you willing to meet with others for the organization’s first meeting?” 3. Select “Position before item”. Click on the element in design view. Under properties inspector, select the following: type – menu Click “List Values” and enter in options under “Item Label”. Under value, type in “dates” for all three entered. 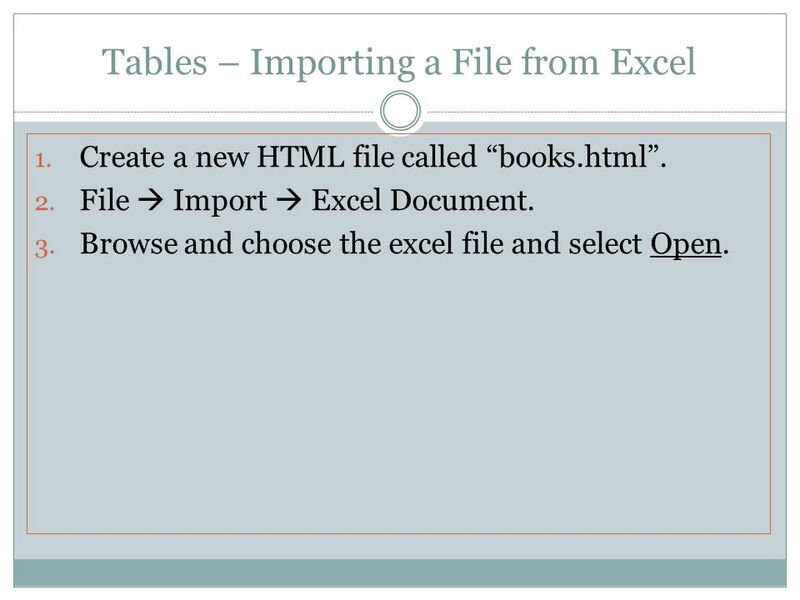 14 Tables – Importing a File from Excel 1. Create a new HTML file called “books.html”. 2. File  Import  Excel Document. 3. Browse and choose the excel file and select Open. 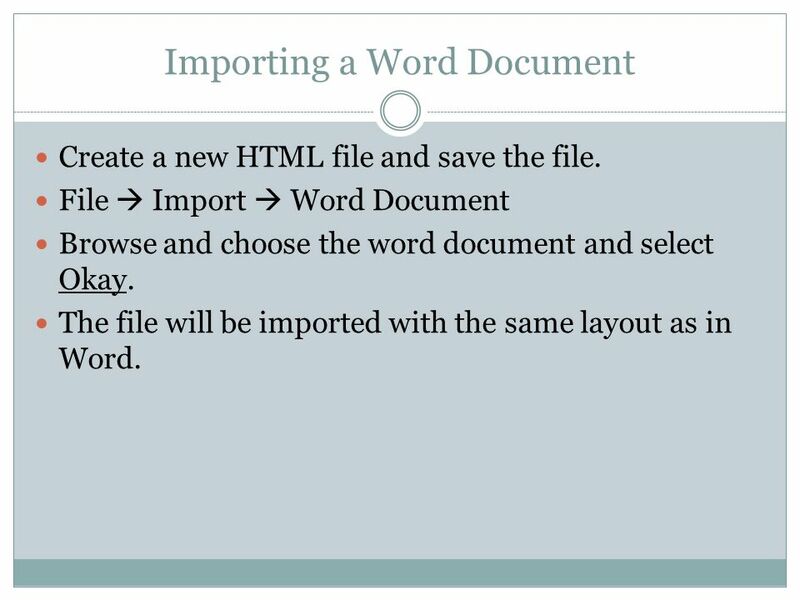 15 Importing a Word Document Create a new HTML file and save the file. File  Import  Word Document Browse and choose the word document and select Okay. The file will be imported with the same layout as in Word. 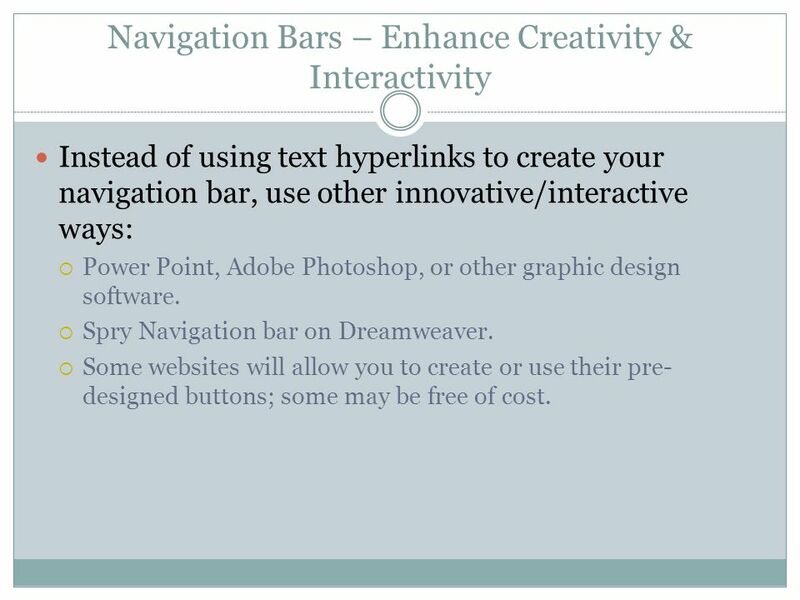 16 Navigation Bars – Enhance Creativity & Interactivity Instead of using text hyperlinks to create your navigation bar, use other innovative/interactive ways:  Power Point, Adobe Photoshop, or other graphic design software.  Spry Navigation bar on Dreamweaver.  Some websites will allow you to create or use their pre- designed buttons; some may be free of cost. 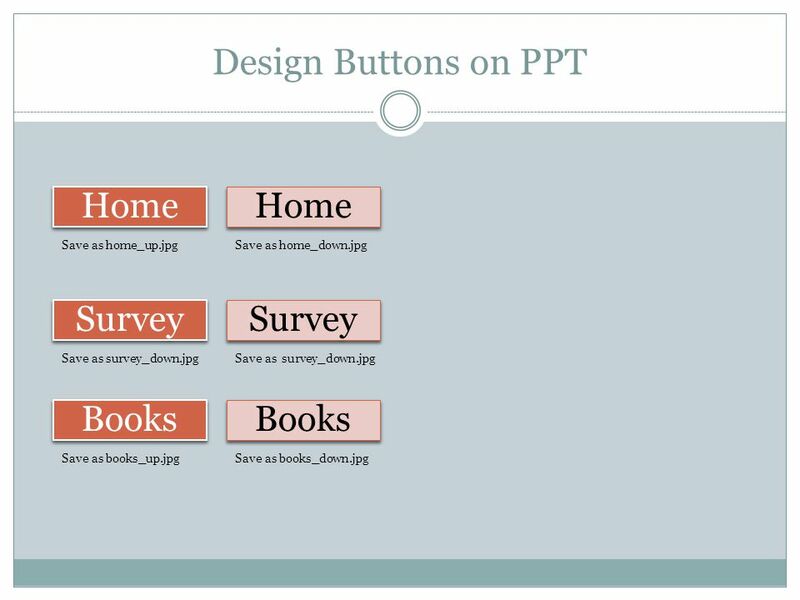 17 Design Buttons on PPT 1. Launch Microsoft Power Point 2. Insert  Smart Art  Basic Block List 3. 5 text boxes in rectangular shape will appear. Delete all except for one of the rectangles. 4. 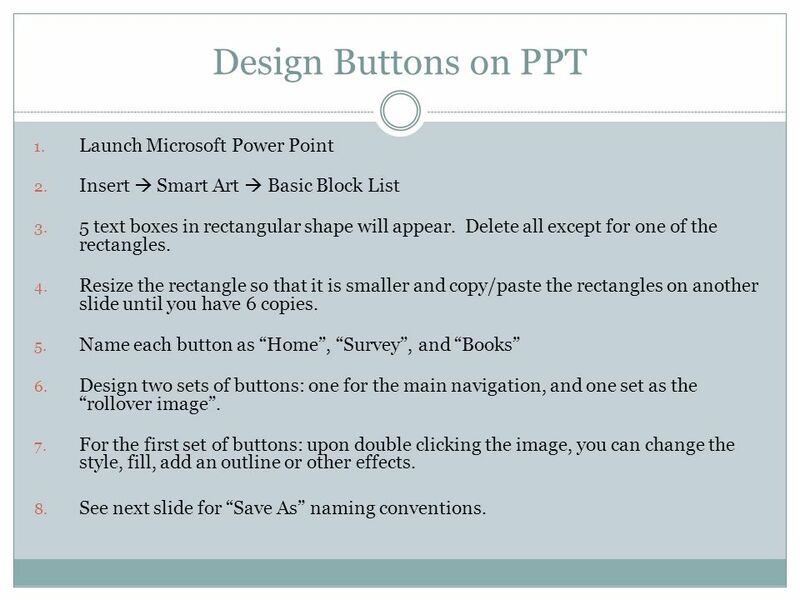 Resize the rectangle so that it is smaller and copy/paste the rectangles on another slide until you have 6 copies. 5. Name each button as “Home”, “Survey”, and “Books” 6. Design two sets of buttons: one for the main navigation, and one set as the “rollover image”. 7. For the first set of buttons: upon double clicking the image, you can change the style, fill, add an outline or other effects. 8. See next slide for “Save As” naming conventions. 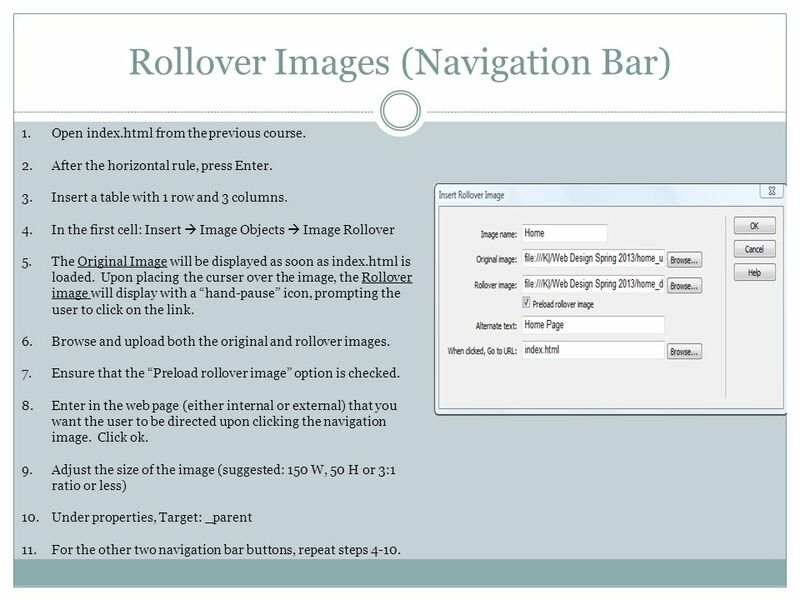 19 Rollover Images (Navigation Bar) 1.Open index.html from the previous course. 2.After the horizontal rule, press Enter. 3.Insert a table with 1 row and 3 columns. 4.In the first cell: Insert  Image Objects  Image Rollover 5.The Original Image will be displayed as soon as index.html is loaded. Upon placing the curser over the image, the Rollover image will display with a “hand-pause” icon, prompting the user to click on the link. 6.Browse and upload both the original and rollover images. 7.Ensure that the “Preload rollover image” option is checked. 8.Enter in the web page (either internal or external) that you want the user to be directed upon clicking the navigation image. Click ok. 9.Adjust the size of the image (suggested: 150 W, 50 H or 3:1 ratio or less) 10.Under properties, Target: _parent 11.For the other two navigation bar buttons, repeat steps 4-10. 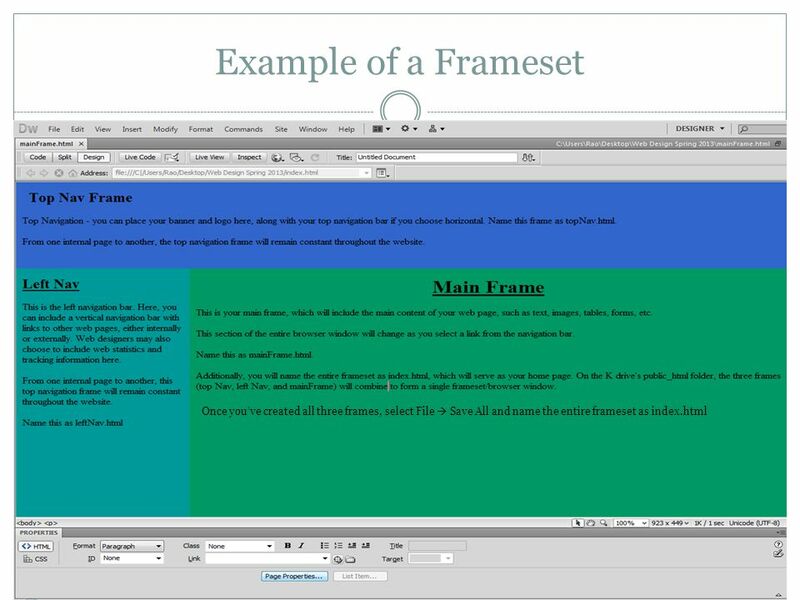 20 Creating Frameset 1. Open Dreamweaver 2. File  New  Page from Sample 3. Choose Frameset from the Sample Folder column and select “Fixed Top, Nested Left” frameset and click “Create”. 4. In the Frame Tag Accessibility Attributes window, click ok. 5. Once you have created your frameset, you can drag the corner of each frame appropriately to adjust the size/proportion of each frame. 6. See next slide for instructions. 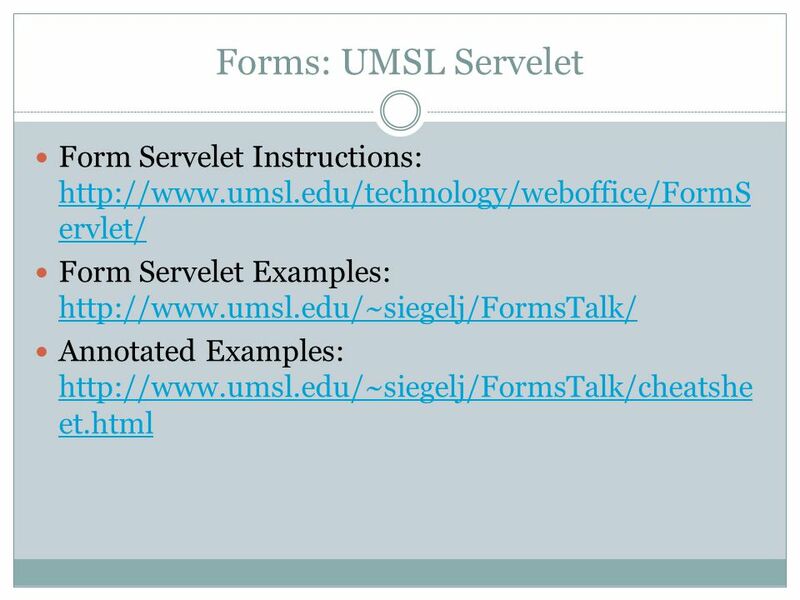 Download ppt "INSTRUCTIONAL SUPPORT SERVICES SHORT COURSE, FALL 2013 UMSL Intermediate Web Design." Chapter 1: Introduction. Contents Whats New in Dreamweaver CS4? 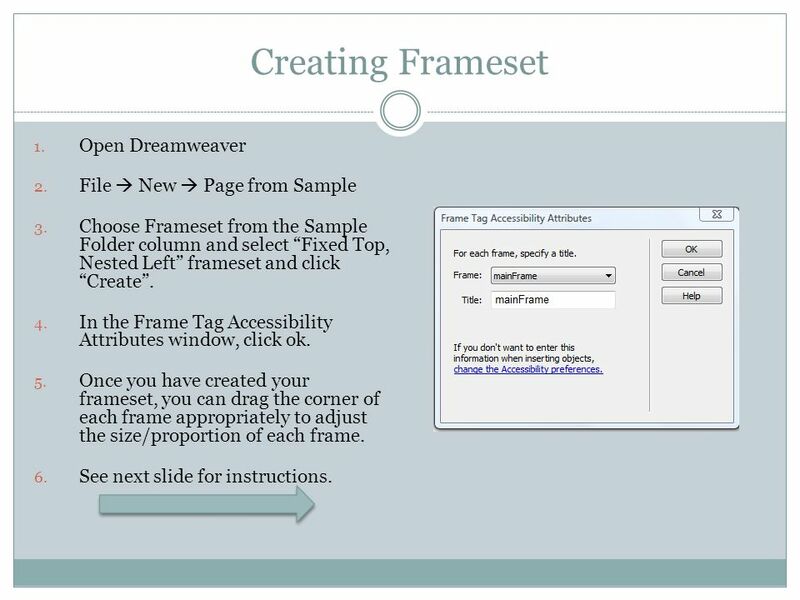 The Dreamweaver CS4 Interface Setting Up a Site Creating a Web Page Adding Text to Your. DREAMWEAVER Welcome to our website! This Presentation Contains Narration and Notes To hear the narration, turn on your speakers or plug in headphones. If you would like to view this slideshow. INSTRUCTIONAL SUPPORT SERVICES (ISS) SHORT COURSE, FALL 2013 UMSL Introduction to Web Page Design. Intermediate Level Course. Text Format The text styles, bold, italics, underlining, superscript and subscript, can be easily added to selected text. Text. 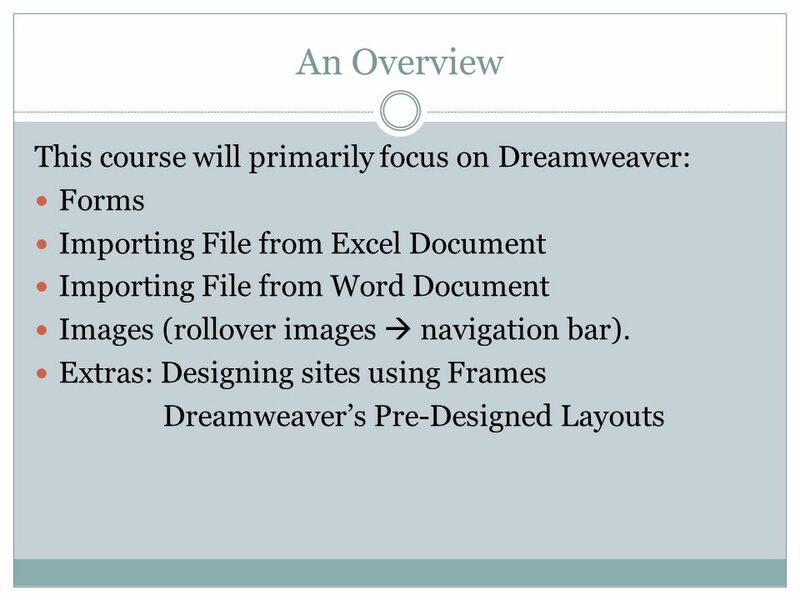 Macromedia Dreamweaver 4 Foundation Level Course. 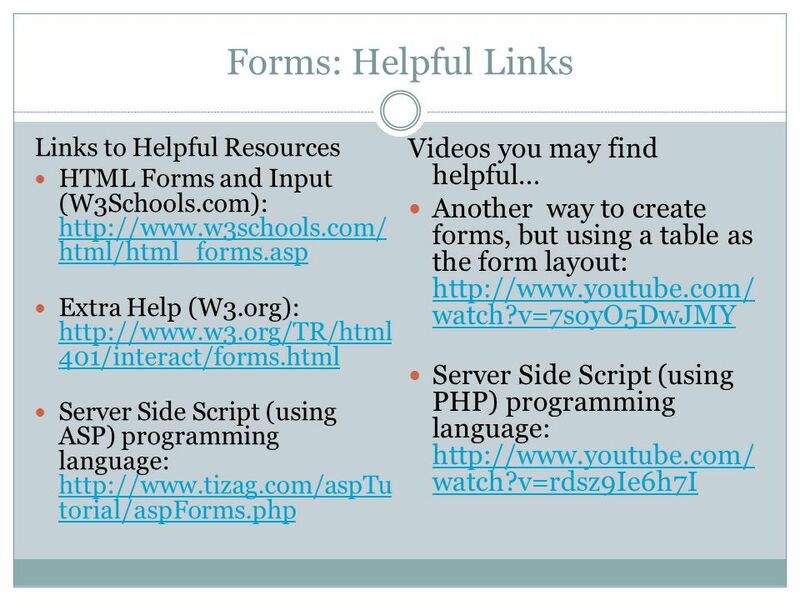 Tutorial 6 Working with Web Forms. 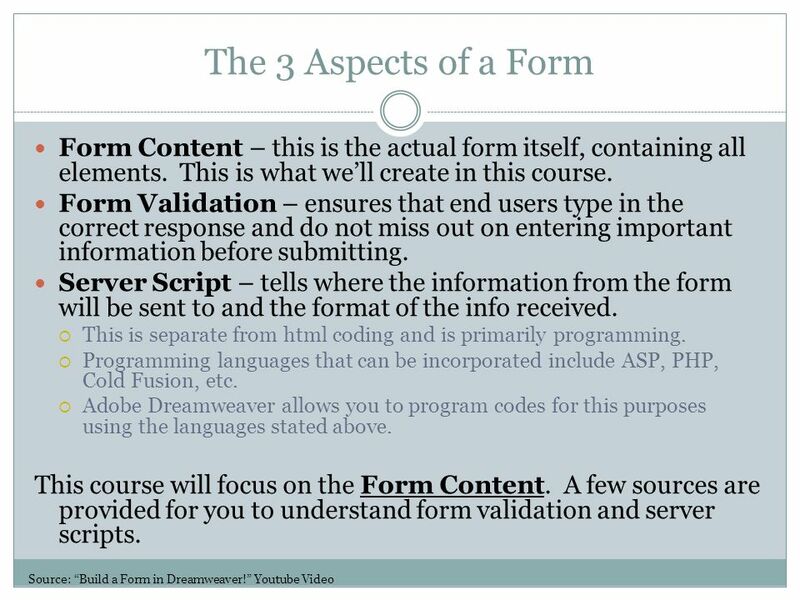 XP Objectives Explore how Web forms interact with Web servers Create form elements Create field sets and legends Create. CIS 205—Web Design & Development Dreamweaver Chapter 5 Using HTML Tables to Lay Out a Page.